Bogey (left) is a two-and-a-half year old Great Dane / Lab mix who displays an aggressive bark when anyone knocks on the door or walks by the fence in his yard. 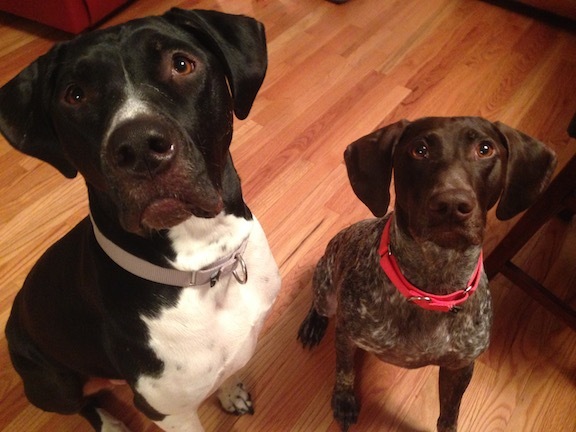 His room mate Shiner (right) is a three-and-a-half year old German Shorthair Pointer rescue. When I arrived for the session, their owner was holding Bogey back by his collar while he barked excitedly at me. Once I got in the door, Bogey’s reaction, energy and intensity kept going up. While he was barking in an excited / territorial way, I could see that he was attempting to use his nose. I also noticed that his body language was more in line with excitement than aggression. Because holding a dog back when its excited and attempting to move forward can actually increase a dog’s reaction, I had his owner let Bogey go. As soon as he did, Bogey stopped barking and his energy dipped as he moved towards me. Bogey did some deep deep inhaling and continued to relax as he met me through my scent. When I sat down with his owners I learned that Bogey didn’t really have much in terms of structure in his life. I also witnessed them petting Bogey each time he walked near them. Whenever you have a dog that has a behavioral issue, a lack of structure (rules, boundaries and limits) combined with petting the dog when it demands attention can be a recipe for disaster. When Bogey came over to where I was sitting and poked me with his nose, I made a sound to disagree with the action. The sound caused Bogey to stop for a moment, but then he continued to sniff me like a hoover vacuum so I stood up and turned so that I was facing him. To a dog standing up and facing them is the strongest, most authoritative posture a human can adopt. When I stood up, Bogey backed up and paused for a moment. I waited for him to turn and walk away before I sat back down to continue the conversation with his owners. Over the course of the session, I learned that his owners hadn’t been completely following through when they disagreed or corrected their dogs. In many situations the dogs simply walked away when corrected or given a command they didn’t feel like following. I went over the various ways to follow through in some of the more prominent situations that the dogs engaged in. I also suggested that they incorporate some new rules and boundaries. They don’t have to be major, but little things like making a dog sit before allowing it to go in or out a door can go a long ways toward redefining the leader follower dynamic while also giving the dog the ability to practice self restraint. This self control will go a long ways towards stopping Bogey’s territorial displays when guest arrive or walk by. I also recommended that their owners start asking the dogs to do something for them before petting them, especially when the dog “asks” for a pet (pawing at their owner, nudging them with their nose, barking, whining etc. Each time Bogey attempted this move I moved my hand in such a way that his paw fell off my arm. As soon as it did he would pull it up to try again. As soon as he did, I stopped petting him completely. By constantly applying this consequence when the dog tries this move, we can communicate that the behavior is not desired and actually has the opposite of its intended effect. It will take a week or so, but if his owners stop petting jim as soon as he lifts his paw this way, the dog should stop the behavior on his own. Next I had their owners place Shiner in another room so we could work with Bogey directly. I went through a few different forms of body language communication as well as a leadership exercise to help Bogey practice looking to his owners for guidance. Bogey was a bit of a character at first, but as we practiced he got better. Once he was showing me what I wanted, I coached his owners through the exercise until they got the same results. We changed up dogs to practice the same with Shiner. She kept trying to jump up on her owners which they said was an old habit. I showed them my preferred method to disagree with the jumping up. It didn’t work as well as it usually does so after a few attempts, I suggested a few other techniques. We had to keep applying them but by the end of the session, Shiner was hesitating while she started the motion of jumping up. When you see a dog start to restrain itself this way, you know its beginning to understand. Sometimes old habit kick in which is why its important to practice new commands or exercises until they are second nature to the dog. After going over a few other things, I had one of their owners step out back so that they could walk around and play the part of a guest knocking on the door. As soon as Bogey heard the knock his energy level went up. So did his hackles and the barking started. As a large dog, his bark had some substance to it. It was more than an alarming bark so I paid particular attention to his body language as I walked over to the doorway. Often when a dog gets over excited at a door, the owners rush to get to the door or correct the dogs so that their guest doesnt hear the barking. The side result of this rushing is that the dogs sense the owners are unsettled. This can often exasperate the problem. I causually walked over to the door and as soon as I was past the dogs, I turned to face them then used movement and body language to claim the door way. Bogey was still intense, but he did walk away and give me the space. We practiced a few more times and while he wasn’t perfect, Bogey stopped reacting so strongly. After a few moments, Bogey was able to stay siting on his dog bed across the room as we simulated knocking at the door. I suggested that his owners practice claiming the door so that he will develop a new way of behaving when guests arrive. Based on his progress over the course of 30 minutes or so, I expect his owners will be able to recondition him and develop a different, calmer greeting when guests arrive before long. At the end of the session, their owners agreed that both dogs were calmer and responding much better to their lead. It will take some effort, but based on the changes in their behavior during the course of the session, its clear these are both smart dogs who want to please their owners. As they consistently communicate what they want and desensitize the dogs from actions that trigger excitement, they should continue to adopt these new calmer behavior and manners permanently.